Glitterville's Handmade Christmas is as bursting as a mantle-hung stocking with twenty new whimsical, winter-wonderful craft projects that will fill your home with sleighfuls of cheer. Hundreds of beautiful, easy-to-follow, step-by-step full-color photos and how-tos make the crafting fun and the results foolproof. From a Jolly Dolly Holly Wreath or a charming Glittery Village you can nestle into its own Sparkle Forest, to the frostiest Magic Snow and the jolliest pine-cone-bodied Glitter Gnome, "yule" find everything you need to make your home glisten and shine this holiday season! 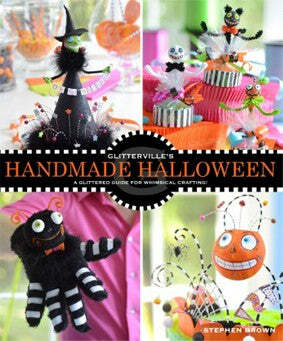 Glitterville’s Handmade Halloween: A glittered guide for whimsical crafting! Treat yourself to the kookiest compilation of Halloween crafts and decor ever assembled, with twenty whimsical projects by Glitterville creator Stephen Brown. Here you’ll find crafts ranging from kooky cupcake picks and Halloween folk figures to pink pumpkin balls and candy garland, so grab your glitter and glue and get ready to make it, and make every day a holiday!